As a student, you may ask yourself if it is really a good choice to spend your time volunteering. Most students who say “yes” find that there are both immediate and long-term benefits to serving. The advantages are so clear that most schools and universities in Australia promote and advertise opportunities for students to volunteer. If you are still uncertain as to whether to try it out, consider the potential benefits of volunteering. You can find work that fits your unique interests, personally or professionally. When you take the time to serve your community, it builds your character. Contributing to your community helps you get more connected to others. Serving as a volunteer also affords you the chance to develop your skills and experience. Service opportunities are often wide open for international students. Serving as a volunteer allows you to try out different things and helps you discover new directions you might not have found otherwise. There are many local and international opportunities for students who want to volunteer. The experiences and expertise that come from volunteering work can broaden your career options, especially in a difficult job market. By the same token, if you volunteer and find out that you are not well suited to the work, you can more easily move on to something different that you enjoy more. You can make better choices about your future career by learning what both you excel at and what you do not like doing. In the process of helping others, your experiences will actually help shape you into a nobler person-someone who understands that there are more important things than making a lot of money. Investing time in volunteering demonstrates that you are a helpful, committed person who can do valuable things beyond your academic performance. When it is time to interview with prospective employers, having outside interests and community experience are outstanding assets. They indicate that you are a motivated all-around contributor that is worth having on their team. Not only will such opportunities lessen your feelings of loneliness, you will often gain solid job references and networking contacts. It may be that your future job will come through a person that you or your fellow volunteers know. Thus it is important to cultivate positive working relationships, end your service time on a friendly note, and stay in touch with your fellow workers or supervisor. This way you can ask your contacts to serve as references for you later in your job search. Working with others provides excellent opportunities to hone your communication skills in particular; these are crucial for international students when it comes time to interview for paying jobs. In addition, many volunteer positions require a cover letter, resume, and interview before you start. Applying as a volunteer allows you to practice these necessary job-hunting skills ahead of time and grow in confidence. Presenting your experience confidently will give you a big advantage when it is time to apply for jobs in your field. Rather than being confined to working in a low-paying job unrelated to your degree, you are free to look for options that interest you and/or relate to your future job. And unlike paid work where students are limited to part-time hours, volunteering work for a non-profit organization does not have visa-related limits. 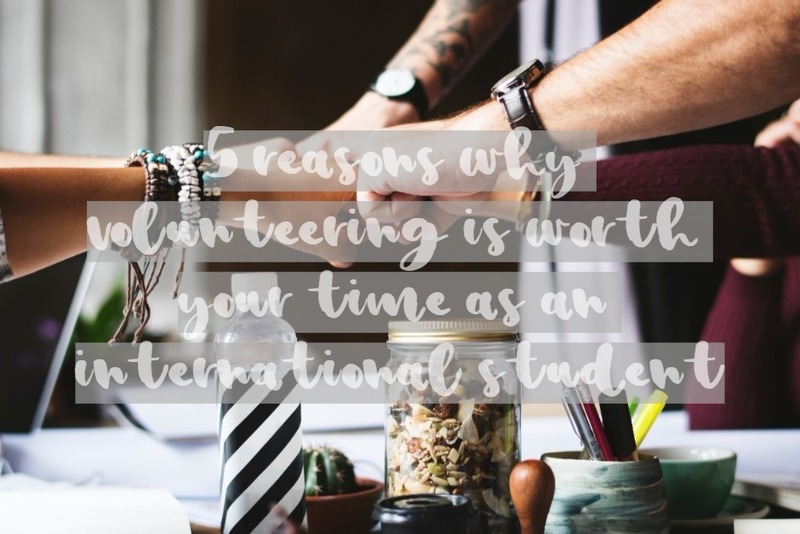 Furthermore, being an international student can be an advantage during holidays and breaks, when many native volunteers have family obligations that take them away. As an international student away from your home country you may be able to help out at these precise times when organizations are likely to be short-staffed, which will be greatly appreciated. Thus, volunteering work is a unique situation where being an outsider can prove an asset since you have greater availability. When it comes to completing your education and preparing for a successful entry into the right career, volunteer experiences may be just as important as selecting as your field of study. The benefits of volunteer experience usually go far beyond building an attention-getting resume. In the short-term, such work fosters meaningful connections with people you have met in the process. Later you may find that you have gained valuable insights about yourself through volunteering and have developed into an outstanding job candidate.